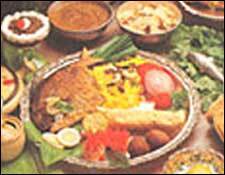 Parsi Food Festival is an event that took place on 18-Mar-2006 in Hyderabad. The fusion of the rich Persian and Gujarati food is Parsi - an aromatic, exquisitely spiced cuisine. Secunderabad Club brings you a spread of this toothsome cuisine on the 18th of March. Abad Wadia and his troupe of chefs present you with the authentic flavours and scents of the Zoroastrian heartlands in Gujarat and Mumbai - Salima Murg, Patrani Machchi, Mutton Kebab, Mutton Dhansak, Paneer Greenpeas Patiya, Rai Potato, Parsi Stew, Veg Kebab, and Dhansak Dal, all prepared with perfection to make you feel like you are at a Pateti feast. Achaar,Paapad, and the Kachumber Salad that is as indispensable with Dhansak as ketchup is with a burger, will accompany the food. For dessert, you have Parsi Custard and ice-cream. Be the first to comment on Parsi Food Festival! Just use the simple form below. fullhyd.com has 700,000+ monthly visits. Tell Hyderabad what you feel about Parsi Food Festival!